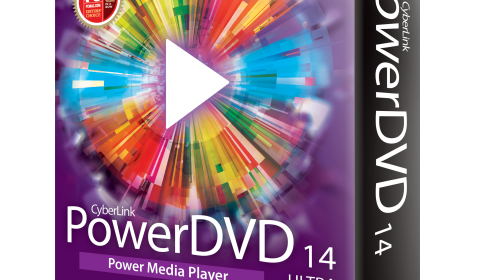 Last year CyberLink added the option to subscribe to PowerDVD alongside their cloud service, and that continues to be available this year with PowerDVD 14. The $44.99 per year (or $14.99 per quarter) alongside the standard purchase options of Ultra ($99.95), Pro ($79.95) and Standard ($49.95). If you opt for the subscription or Ultra 10GB of CyberLink Cloud storage is included in the price alongside the Android/iOS/Windows 8 “Metro” Power Media Player. There are quite a few new features this year, including HEVC (H.265), WASAPI audio support, and automatic cloud-based file synchronization between clients. I’ve had the chance to play with a beta release of the product – click through for some impressions an the full PR. CyberLink put a lot of effort into making their cloud offering more useful in PowerDVD 14. With features that allow for automatic conversion, upload and download it enables aggregation and a mechanism to sync content between clients (PC and mobile) in a bandwidth friendly way. Video conversion can even hard sub in external text based subtitles (e.g. SRT), and will convert audio (first track only) to AAC for wide client compatibility. Support for YouTube has also been improved, primarily with support for “pinning” videos for offline (downloaded) viewing. It can be done at an individual file or channel level, which is great for automating the process, and enables features like fast-forward that are not available when streaming. Besides support for the new HEVC video codec, PC playback also adds support for WASAPI output. The main benefit for this is that it allows decoded audio to bypass the Windows mixer, which adds null channels and can reduce resolution. Unfortunately, the feature is much more limited than I would like in its current form as it only works during Blu-ray playback. Hopefully, CyberLink will broaden support to all file types and audio codecs like FLAC/ALAC, etc. as the product matures. PowerDVD 14 also includes support for UltraViolet, but I wasn’t able to test it. There’s no setting to play 3D in 3D and 2D in 2D. Enabling 3D is all-or-nothing. Taipei, Taiwan—April 8 th , 2014—CyberLink Corp. (5203.TW), today launched PowerDVD 14, the latest version of the world’s pre-eminent movie and media player for Blu-ray, 3D & HD content. With tablet and mobile video viewing experiencing record-breaking growth, PowerDVD 14 offers cross-platform support with free mobile apps for leading tablets and smartphones, and for the first time, integrates the new CyberLink Cloud service to provide more convenient storing, syncing and sharing of videos, photos and music. Building on its industry leadership, PowerDVD 14 is the first multimedia software to support the brand new High Efficiency Video Coding (HEVC/H.265) format. This next-gen video format is designed for higher resolution entertainment delivery, enabling users to download better quality videos up to 50% faster than current formats allow. In addition to these world firsts, PowerDVD 14 comes with more than 50 new and enhanced features, including expanded video and audio format support, more customization options, and the ability to watch enhanced YouTube videos offline. Universal Media Player – PowerDVD supports all popular video, audio, photo and music formats from discs or files, including new H.265, AVCHD 2.0, lossless APE & ALAC audio, 4K and MKV. It also offers full support for the newest UltraViolet™ standards for premium video content streaming and download in the US and other markets where available. 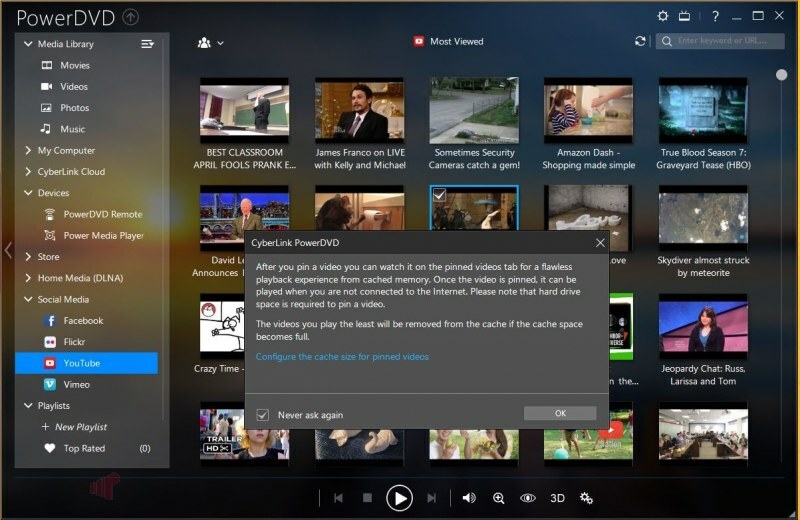 Cloud Connected – Users of PowerDVD 14 Ultra will receive a year’s free subscription to 10GB of space on CyberLink Cloud, where they can store media, sync it across their PC and mobile devices and even share it with others. Across Devices – New Power Media Player brings CyberLink’s award-winning multimedia technology to iPhones, iPad, Android and Windows 8 devices so users can stream and copy content seamlessly across connected devices on home networks. Better YouTube – PowerDVD now features “pinning” functionality so users can save YouTube videos to watch offline. Pinned videos can be upscaled to HD or 3D, enhanced with lighting and noise reduction adjustments, and enjoyed using PowerDVD’s fast forward and slow-motion features. Use PowerDVD as your digital video recorder (DVR) for YouTube. PowerDVD 14 is available today from the CyberLink online store in English, French, German, Italian, Spanish, Chinese (Simplified and Traditional), Japanese, Korean, Russian and Portuguese. PowerDVD Remote is free for PowerDVD 14 Ultra/Pro/Standard users and can be found on the Apple Store and Google Play Store. Power Media Player is free for PowerDVD 14 Ultra users and is available on the Windows, Apple and Google Play stores. CyberLink’s broad portfolio of multimedia applications can be categorized into two main areas: Media Entertainment – PowerDVD being the flagship product in this category, provides the latest in media playback on PCs, across devices in the home network, and on-the-go with portable smart devices; and Media Creation – offers a series of software to create enticing videos & photos, author Blu-ray & DVD discs and more. CyberLink has built strategic partnerships with leading CPU and GPU providers and a solid reputation for delivering high-quality, interoperable, and fast time-to-market solutions that keep our OEM partners from top PC brands on the leading edge. CyberLink’s worldwide headquarters are located in Taipei, Taiwan, with regional operations offices in North America, Japan, Europe and Asia-Pacific. The company has 700 employees worldwide, with more than 500 engineers in product design and development.